Booo Food Desert. Yay Urban Farm! A friend sent me this link to a news story about the original “food desert”; Altgeld Gardens. No fresh food in sight, just a liquor store. Sad, sad. Derrion Crawford is the manager of an urban farm in Altgeld. 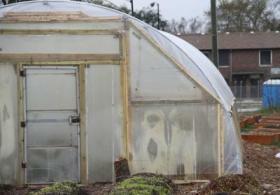 He taught community workers how to compost, build a hoop house, plant crops and be sustainable. I really love stories like this and hope other communities get inspired by what’s going on here. For those of you too lazy to read, the article is narrated in a movie on the site as well. Entry filed under: In The News. Tags: Altgeld Gardens, Derrion Crawford, Food Desert, Urban Farm.